It was a brisk morning with threatening clouds as we, my Mother and I walked quickly to the entrance. With baited breath, we bought our tickets and rushed the double glass doors. Elkhorn Quilt Company, where we found the adorable BoxyPattern, Mom bought the kit (we'll make it together in March at our next retreat). Fiberworks had one last kit available for me to make My Kinda Town, so I was thrilled about that! Look how cute her booth is! And Laura, the owner was there greeting everybody! I want to evolve my quilting skills so I picked up a starter kit of rulers at Gina Perkes booth The Copper Needle. Jan the owner of The Quilt House is always so nice to us. (Years ago we visited her at her actual store in Gardnerville, a must see if you find yourself in Nevada.) Material Girl was so accommodating and I look forward to seeing them again next month at Quiltcon! Another favorite part was meeting up with my retreat friends! Seeing all of there beautiful faces made me so happy! Sunday I arrived again bright and early to take my Clam Shell Class, say that three times fast! In never taking a class at a show before I was nervous, not knowing what to expect. I tried to pack the usual must-haves for a class like chocolate and fabric but mostly chocolate. It was a great experience and as you can guess the teacher and pattern maker, Karla was very nice and equally informative. If nothing else the tips and tricks you learn in classes like these are invaluable! It was great to be able to take a "lunch" break and to walk the floor again because the classroom is directly in front of the showroom! Dangerous for my pocketbook but oh so fun! I didn't get as far along as I'd hoped in class but I learned the skill of sewing curves confidently and how to in-set a circle and had lots of fun with mind liked quilters of all ages and skills. I must add my Michael Miller Lovely Lamas fabric was such a huge hit classmates and instructors were leaving midclass to go back to the vendor where I purchased it! Too fun! Overall the entire weekend was a blast! The pure inspiration and camaraderie at shows like this just warms my quilted heart! Like with any quilt show, I really can't wait until the doors open. My heart is pumping fast, my mind is full of "what goodies will I find today", and the fright of breaking the bank and finding too much always makes me a little nervous! Will I be able to carry home all that I purchase, or will my bag be overflowing? I discussed not going to the show with my husband and his exact words were "why would you not go?" Gosh, I love this man. So with that vote of confidence, I was going! I have the oversized tote bag (see Cutest $1Tote Bag Ever) for two reasons 1) to pass on all the plastic bags that you can collect in the day and 2) to hide all my glorious goodies from my husband when he picks me up. That way when he see's something new laying around my workspace I can say "that old thing"! :) I'm just teasing. So this show was a small show, around 30 vendors. I had planned to be here all day, but it took all of about two hours for me to go through. One of my favorite local Quilt Stores was there, Quilt Emporium. They are always so sweet, and I love to support them. I also found a new online Quilt Store called Patti Cakes. She had lots of prints I'd never seen before. As usual, beautiful Quilts were hung from every rafter. You could spend hours just admiring the artwork! Luke Haynes was the featured artist. I just started hearing about him, it was amazing to see his quilts in person. He had some beautiful quilts that's for sure! And look at this one! Quite amazing! I heard someone walking into the exhibit say..."oh these quilts are very masculine". I guess his colors seem rich in strong solids, but a funny thing to say none the less. Clearly Luke is very talented. It's always nice to see familiar faces at these events. I love to ohh and ahh at the truly beautiful pieces of art. What can be more inspiring? I hope you're able to catch the next show in your area. January it will be Road to California and then QuiltCon in February. I better start saving and doing calisthenics for these dynamic shows! If you've never been, Goooooo! They are amazing! Until then, shop local my quilty friends! We are so glad we were able to check Portland Oregon off our bucket list. We visited in May 2017. We ate great meals, visited amazing brewery's, and hit the local quilt shops! That pretty much sums up our trip! We wanted to break from the day to day of Los Angeles, so we packed up and went to Portland. The flight was only 2.5 hours from LAX but boy did it seem different! For one, it rained everyday on us! Everything was sooooooo green and lush, quite the opposite the dry conditions of Southern California. The people seem very different as well. Life seems to be slower and simpler. Grunge is still pretty strong in Portland. Pink, purple, or green colored hair, tattoo's or/and a piercing seems to be the norm. And Subaru's rule like Prius's in Cali. 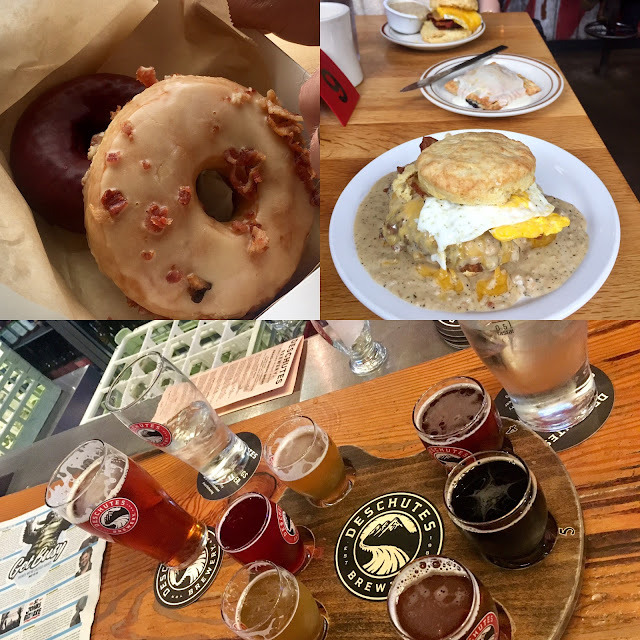 To make the most of our short trip, we used Yelp to help guide us to local hot spots. We also used AirBnB for our lodging. I really wanted to find a location that would provide us with the vibe of the city. Our booking turned out perfect. We were 20 mins away from most locations that we wanted to visit. We started our mornings (yes that's plural) with Pine State Biscuits. These honestly were the best biscuits I have ever had. I chose the "make your own" with egg, bacon and cheese! Mmmmmm yes please! Then we headed over to Powell's, the largest privately owned bookstore in the States. We actually had a lot of fun checking out all the different rooms and levels. We then decided to wander the streets. This is the Peal District, it's great for window shopping. We stumbled upon Deshutes Brewery and tried some flights. The bartender gave us some recommendations, which is always fun. We try to leave vacation planning pretty loose, that way we can let the trip be somewhat spontaneous. Listening to the advise of the locals seems to pan out for us! In trying to make the most of every day, we rushed over to the Wool Mill Pendleton shop where I only had 15 mins to shop before they closed - and they let me know it when I walked in! Of course I wanted an hour an 15 mins, but I was happy to get what I could. My friend Cat said to hit the scrap bin, and that's exactly what I did! 13mins later I was at the register with my bag of wool scraps! Now I need to find some wool tape to put it all together but we can save that for another blog! We then headed to Cool Cottons. They had a wonderful selection of great focal fabric's, and the staff was super nice. All in all a pleasure to visit! Don't miss it if can! We did leave Portland and visited Astoria, OR. Boy was that pretty! The drive was relaxing minus the logging trucks. The architecture was amazing. Did you know some of Goonies was filmed there? Driving around the area I could totally see it! And of course when in Rome...we hit the local quilt shop Homespun Quilts & Yarn. The owner said they keep very busy especially because of the weather. It had been rainier than previous years so everyone stays in and Quilts. I'm all for that! We finished our afternoon at The Buoy Brewery overlooking the ocean with delicious fish and chips and clam chowder. It was a perfect break before the next destination, Cannon Beach! Driving into town we couldn't help notice the huge rock formations...(One eyed Willy was murmured by both of us.....Goonies reference) Isn't it magical? We of course stopped into Center Dimond, the local quilt shop! Sit on down for this fact..she has over 3k bolts! My husband said while getting out of the car, "take your time Honey, I'll just wait for you in the car"....little did he know how long I could visit! He got a really good nap out of my visit, and I got a few goodies to add to the stash. He was well rested for our 2 hour drive back to Portland. On the way we came across this great Lumber Museum. Totally worth the stop so many cool things to see! Back in Portland we received a tip to hit a Tiki Bar called Hale Pele, another really cool location. The food looked great, but we held out for Screen Door. The wait can be a few hours to get into this Southern cuisine hot spot. We lucked out and only waited one hour, but it allowed us time to walk around the neighborhood. The Commons Brewery - try the Farm to Table Seasonal beers and the charcuterie plate. Super Yummmm! Pay Dirt - Cool Whisky Bar, if you're into that. Reside in a super cool shared space with other restaurants. Salt N Straw- Best Salted Carmel Ice Cream we've ever had! As you can tell we ate, drank and shopped our way through town. It really was the perfect trip for us! Stay weird Portland. We'll be back! Every year for work we head out to a huge convention in Las Vegas. Every year we drive. The employees that go change a little from year to year, but we always drive. This year I decided to bring my sewing machine, the Janome 6600 and of course that meant I needed to bring a few projects…and of course since I’m visiting, well, I gotta check out the local Quilt stores that I’ve never been to! Keep in mind we arrive Sunday evening and we head out mid Wednesday. I had big plans - I always do! I also needed to fit in some work! We stayed at the Monte Carlo, which was nice. It’s at the end of the strip. Here's the view! This was my room set up! I wasn't missing a thing! You can even see my laptop there among the fabric. Yes...it's closed but incase I need to work, it was right there ready to be cracked open! The nice staff member who brought me room service (come on! It’s Vegas, you gotta get breakfast room service! Lobby beer, too, while on the topic of musts!!) wanted me to make them a quilt…I’ll just add them to “the list”! HA! So Monday morning’ish (again it’s Vegas...) I hit the taxi line at 11am to head to the first shop, Christmas Goose Quilt Shop! $65 dollars later…ouch! Should have caught an Uber. I heard you couldn’t Uber out of the Vegas Strip hotels, but you can - you just need to go to a special spot! Livin and learning! They have an interesting shop, and a must stop if in the area. Next up was Sew Yeah Quilting. They have over 3 thousand bolts! I was in paradise! Was this my oasis mirage in the middle of this desert? No! It’s real, and the staff was very nice and helpful and greeted me warmly as I walked in! Just the experience you’d want when walking into a Quilt store for the first time! The sun was setting, and I Uber’ed on back to the hotel ($14. should have Uber'ed the first trip!). I found so many goodies! Did I accomplish all of my goals, no. Seems I never do because there's just never enough time! I did finish this backing to one of my quilts, so I'm pretty happy with that! Tuesday I worked my tail off (for my my actual job) then Wednesday came in a blink of an eye, and it was time to head home. Packing up and heading out! Traveling with my sewing room was a little tough, but totally worth it! I got to go on my own Quilt run, sew, work, and visit with some of my favorite clients and coworkers. I hit the jackpot! I feel very lucky without ever taking a spin on roulette! I kid you not....I've had this picnic quilt completed -minus the binding- sitting around for ohhh... 7 years! Why have I been dragging this out for so long? Truth be told, binding is just not my favorite thing to do in the quilt making process. I still have a stack of quilts that need to be binded, but those were made last year, and are going to be gifted this year! What is it about hand binding that binds us up? Well, I was binding backwards for a long time which didn't exactly help! If every you find yourself struggling with a task, go in and ask for assistance from your Quilt store! Then practice practice practice! I really need to get better at completing this step faster. I have a Quilting Planner, and I think this is just the tool I need to hold myself accountable. I was such a different person when I started this quilt, but I do still love everything about it. I didn't use a pattern - I just created, as I still do today. When I think of the type of quilter I am, Modern or Traditional, I look over the quilts I've made and believe I like to tell a story in my quilts. I like the fabric to make sense in my head; to flow. The fabrics need to relate to each other. Are y'all like this too? So in this quilt, I found those ants who are trying to carry away all the picnic food adorable and they really set the mood for this quilt. The dark red fleshy fabric reminds me of watermelon, which of course you'd want to be eating on a picnic. Then some cute ladybugs that just might want to come down for a visit if you were having a fun time on a grassy knoll. I think the black and white fabric is just the right about of pop. I remember when I was making this quilt....every Saturday morning I'd pick up my Mom who lived a few blocks away and we'd head down Olive Street in Burbank, CA to go sew for the afternoon with our friend Jan. I miss these days. I can just hear my Mom say "oh yes, that really pops!" "Pop" was thrown around a lot in our little quilting haven. Back in the day, my coworkers wife long armed so I send it off with him, and soon enough it was done. She used clear thread in the top and black in the bobbin. The motif is an apple being eaten, so there is a full apple then one with a bite taken out, and another bite taken out, then just the core. It's perfect for this quit. It's just a down home fun useable quilt. We've been having some beautiful weather these days in beautiful Southern California, some would even say perfect for a picnic! My new favorite thing are Podcasts. Really, it's my husbands fault! We love going on little road trips. Sometimes you just can’t get away for large chunks of time but you get that deep down nagging feeling like you really need to get away - that’s when we hit the road. We’ve found little weekend getaways can be a big relief. It seems to simmer that boiling tea pot until we are able to take a real vacation. So it was on one of these weekend trips where he introduced me to America's Test Kitchen (Chris Kimball, an ATK founder, has since created the new show 'Milk Street', which is now our favorite cooking podcast, but that's a whole other story!) I'm not sure where I've been! I had no idea this platform even existed. We so enjoyed our drive learning about different cooking techniques, gadgets, chefs and more! I was hooked. We spend so much time cooped up in the car stuck in traffic, why not spend that time learning!! My husband took it one step further and says… "well you know they probably have sewing and quilting podcasts"
My brain started to spin, I could barely speak, I just handed him my phone! Would you believe he was correct?? It was like Heaven’s gate opened as I tapped play on my iPhone and listened to Modern Sewciety. I would hands down recommend this podcast to everyone interested in creating. And I say creating because while I might not have a passion for cooking, I love to eat, so I love hearing about the different techniques! It might be the same thing for you! Stephanie, the hostess with the mostest at Modern Sewciety, is one of a kind! This might sound weird, but I enjoy the sound of her voice. She just sounds nice, and she has an addictive laugh. You can just sit back and enjoy the time you share together! I've learned so much from listening to her and diving into her podcast notes to find out more info. I love hearing about the latest quilt pattern book, or about new websites. For example, a site called Massdrop that sells one Quilting goodie a day. I wake up early every morning to see what's dropping today! Maybe not so good on my checkbook, but really interesting! If I don’t have you hooked yet, here are some of my other favorites and you let me know yours! The Simple Show - This is all about traveling families, books to read, lives shortcuts. How I Built This - About normal people who've created empires! Heavyweight - Light heartedd storytelling by a fun quirky host. In the Dark - This is a very intense drama, not to be listened to with children. I don't know about you, but I love finding vintage sewing machines.ccI wonder how old they are, what they've made, where they've been. I wonder what's happened to their owner? Did they love their machine? Did they sew all the time, or was it never pulled out of the closet? Was it a wedding gift, or something they saved up to purchase? Did they sew because they loved it, or was the sewing machine a way for them to earn a living? What to you think about when you find an old beauty like this? You can barely read Singer across the front of this one. It's been really well used. In 1851, Isaac Merritt Singer started the Singer & Company in Boston. He created and patented the pressure foot to hold fabric and mounted the needle vertical. Seems like that really set the standard for machines still today. He also tried to patent the foot petal or treadle (I always thought it was called trendle, isn't it nice we can learn together!) but that had already been used for too long for him to include it in his patent. But still, he kind of killed it with the longevity of his design don't you think? It wasn't until 1857 until a true domestic machine, the Family Machine was introduced. Now I understand the love for classic cars. I could sit here for hours looking at the curves of the machine, the colors, the knobs. I wonder if they still run and what it would take to fix them. This Spartan is a Singer Manufactured sewing machine. I do wonder why most of the sewing machine these days are white and most of the vintage machines are black. I think I'd like a black sleek shiny machine! What color would you like? I'm not even sure who made this one, it was in a glass case and couldn't get into it, but you can surely tell it's an old one! And then theres that...what are these babies worth...? Look at this beauty! This one wanted to come home with me! It had a lot of the original parts, the hand wheel spun freely but I just have to wonder what the repair bill would be after spending $200 on it. Look at this Little Betty! (ignore the creepy doll...if...you...can...) These were made in England by EMG. The company started making toy sewing machines in 1935. Straco was an American toy importer, and in 1940, they started importing these. At some point, Straco partnered up with Walt Disney of all people and Snow White was pusing sewing machines for a while! Betcha didn't know that! Umm, this is just true, I couldn't help myself! The White Sewing Machine Company was founded in 1858 in Massachusetts by Thomas H. White. At one point in 1900 they also started making automobiles. No wonder these ran so well! :) SVP Worldwide now owns both Singer and White, and a few other names that I'm sure you'd recognize, Pfaff, Bernina, Juki. This Singer is very close to the one I learned on, and sewed on for twenty years...then the light burned out! Oh how I loved this machine! Isn't the artwork on each amazing. All the designs or decals are different. This little (literally) Sew-O-Matic Senior is also made by Straco (the makers of the Little Betty). This White even had it's original feet box with it. Pretty amazing! I found these next two at an Estate Sale just this weekend! In doing some investigating, seems like there is not an Antique Sewing Machine Museum in the US. There was one in Arlington, VA but it closed. I'd love to go to a Sewing Machine Museum! Add some fabric, and I'm there! FYI, this is not my arm...if it was I would have waxed it first. My husband wanted to show the size of this little Sew Handy Electric sewing machine. At first I thought it said Sew Randy and thought that was a weird way to promote sewing! I hope you had fun strolling down memory lane with me. I hope if you have a sewing machine, it's not tucked away in a closet. If it is, take it out! Take it for a spin! Contact your local Quilt Store ask them when their next beginning class is. Patronize a Quilt Store and they will help you learn how to use your machine!